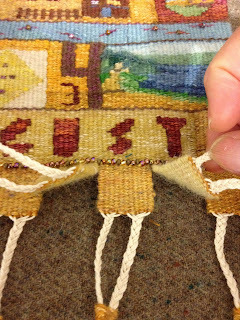 I am working on the finishing of the August Tapestry Diary and thought some of these finishing details might be of interest. I have to admit that finishing is something I enjoy which tends to put me in the abnormal category. 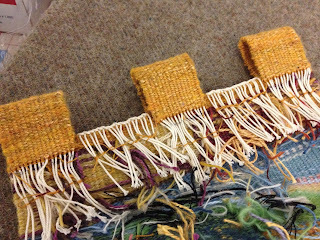 Take a look at the previous post for a picture of the piece right after removing from the loom and the following takes up at that point. Here shows a detail of the back. 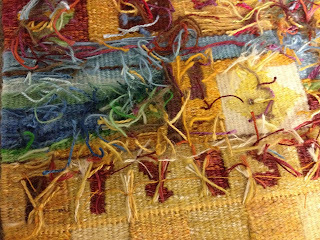 the ends have been trimmed and any ends which are close to the edges of the tapestry have been secured towards the center to keep them out of the way. There was a previous post on finishing with more detail on this process. 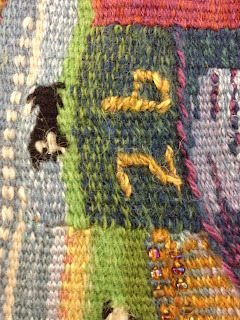 Here is a detail of the top of the tapestry. 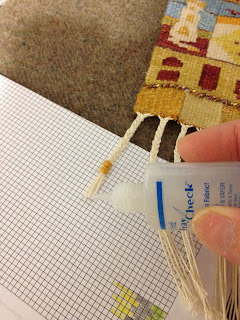 Those long woven tabs that were pictured on the previous post have been turned down to create a hanging tube. Here is a detail of the back. 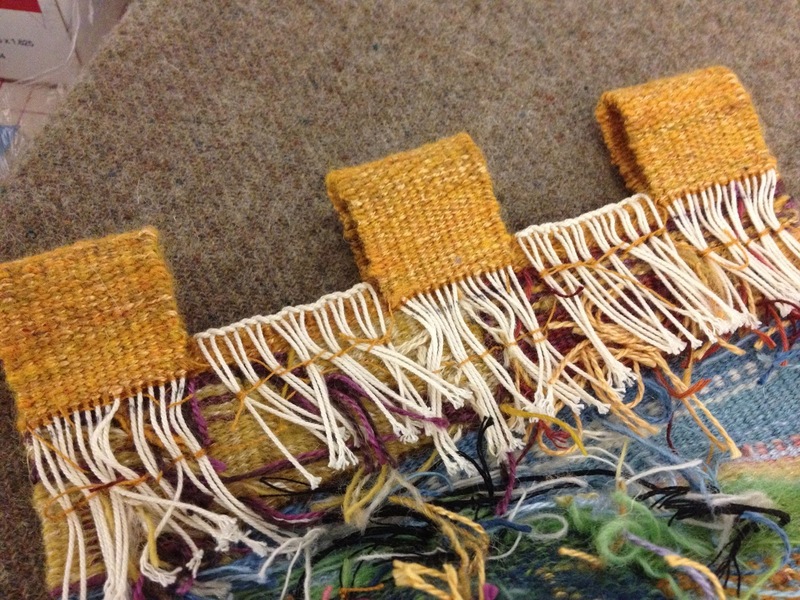 The warp ends have been turned to the back side and secured with buttonhole thread. 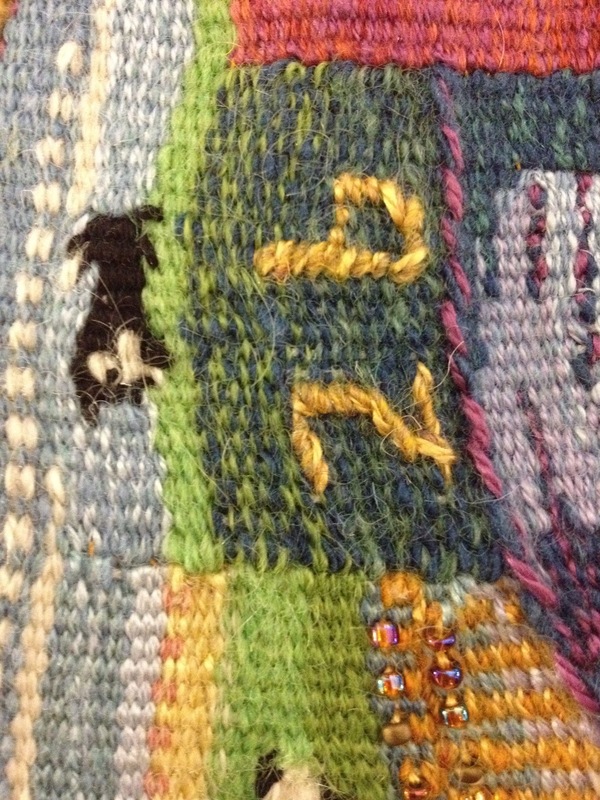 This shows the bottom of the tapestry. 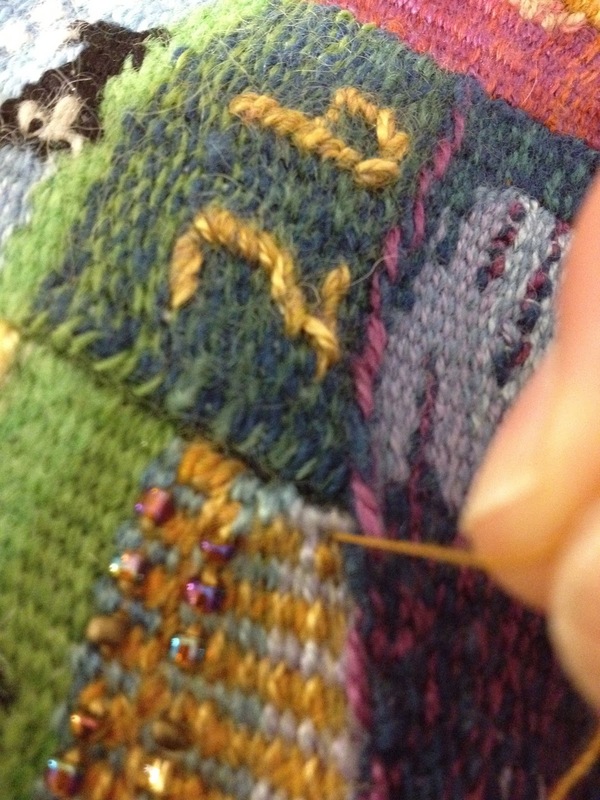 The woven tabs on the bottom are all woven separately and become part of the decorative warp finish. 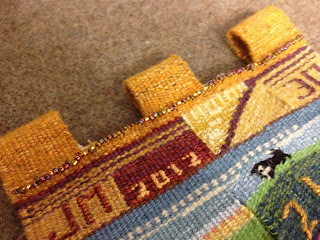 I think that echoes the woven tabs at the top nicely. Here you can see a detail of the separate tabs on the bottom. 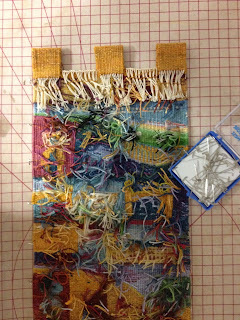 Next I trim the warp ends even on the bottom. A small amount of fray check can help keep the ends tidy. 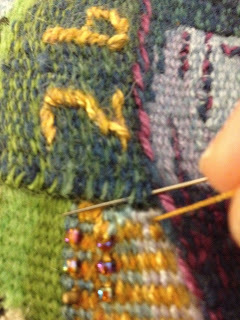 A detail of the braided warps at the bottom. 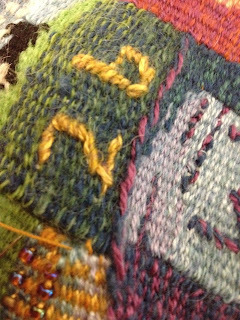 Each one has been wrapped, first with strong buttonhole thread and then with the more decorative wool/silk weft from the tapestry. 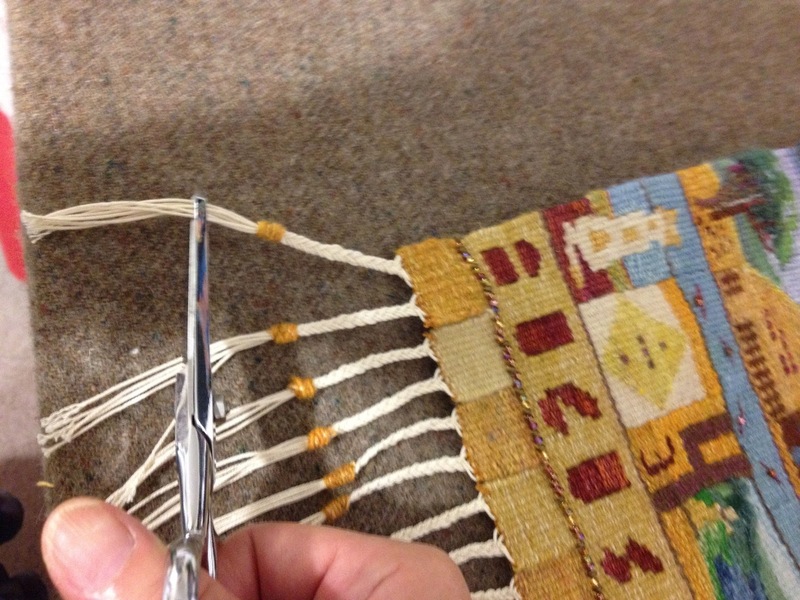 On to sewing the slits. There are many ways to do this. 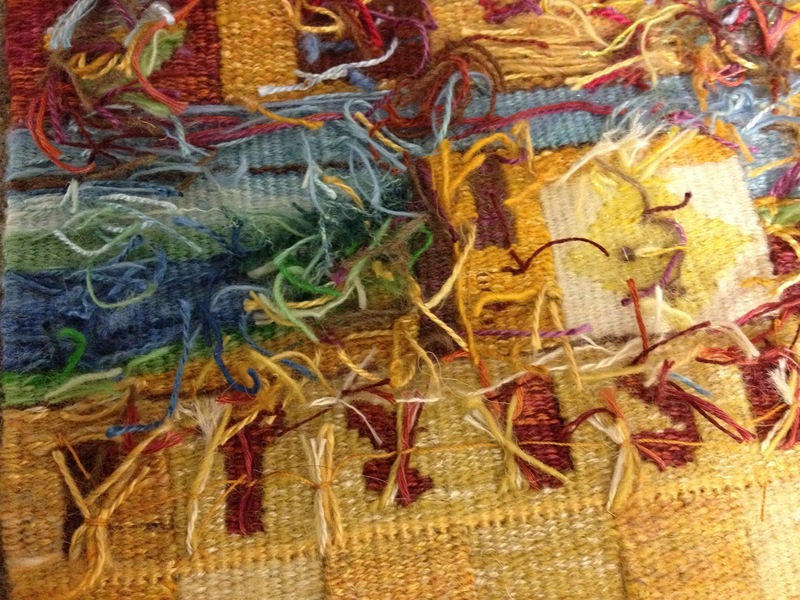 On this piece I chose to sew from the front after the piece was off the loom. 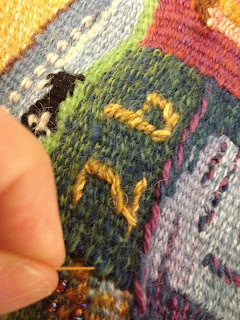 Using buttonhole thread again I secured the thread on the back of the tapestry and brought it up one warp thread away from the slit. 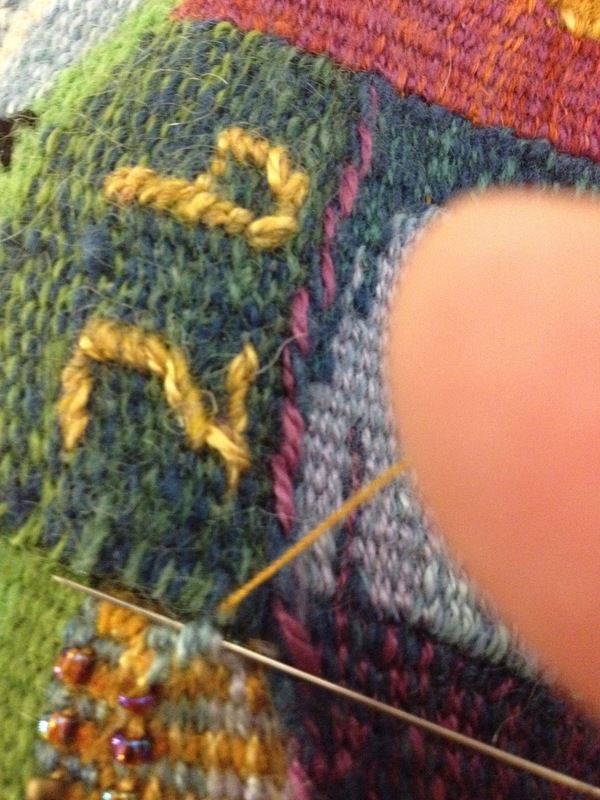 Never pierce the warps with the needle as that could compromise the strength of the tapestry. Move over to the opposite side of the slit, go under about two weft threads. 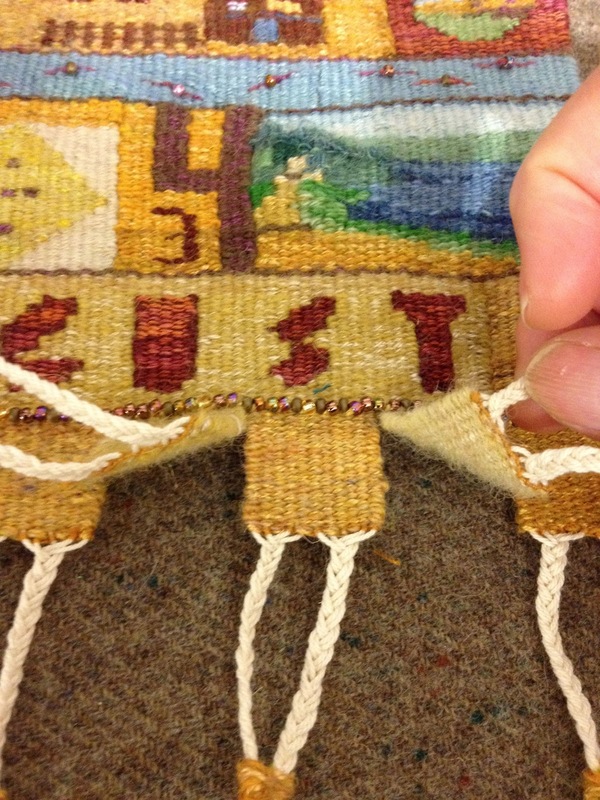 Pull the thread taught without distorting the tapestry. 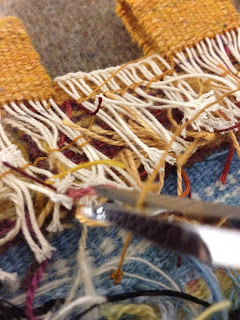 Move across to the other side and repeat going under two weft threads. When pulled taught the thread that lays across should disappear in the wefts. 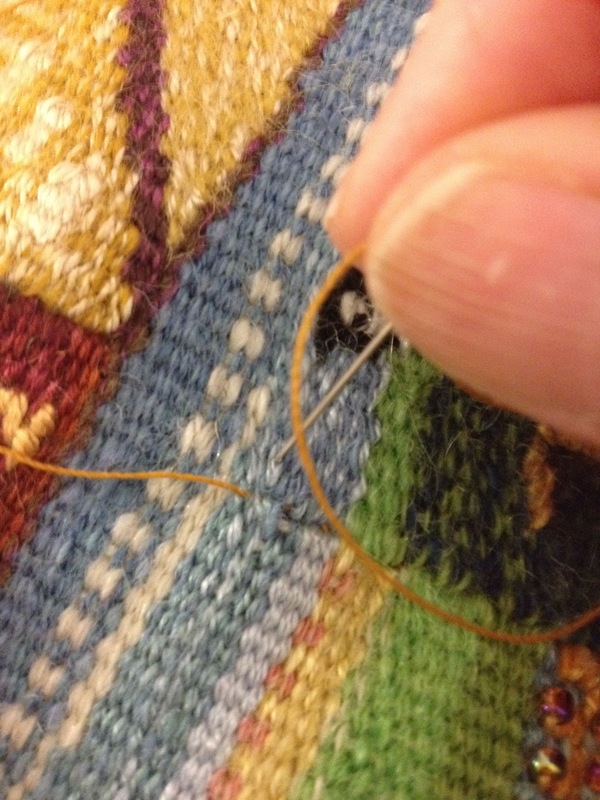 Here you see the thread right before pulling the thread taught. 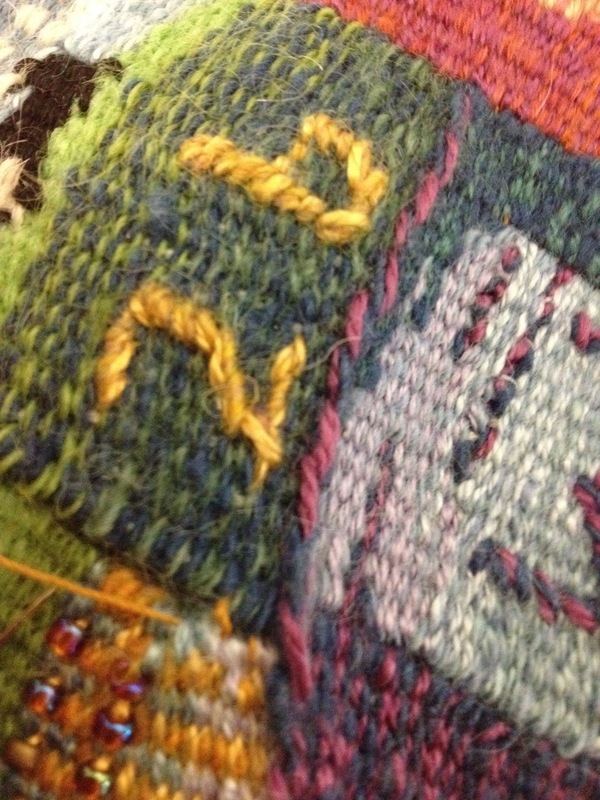 Here is the completed stitch. 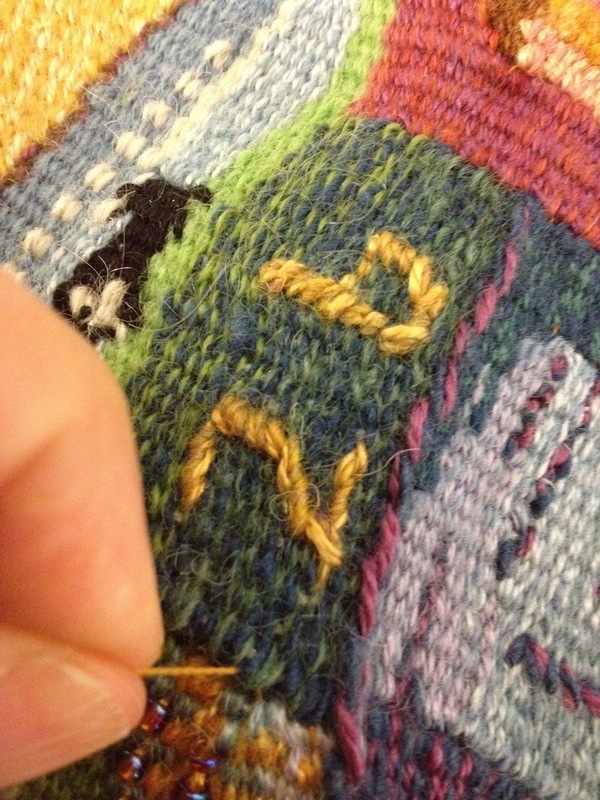 At the end of the slit move over to the other side including a warp thread in the stitch. 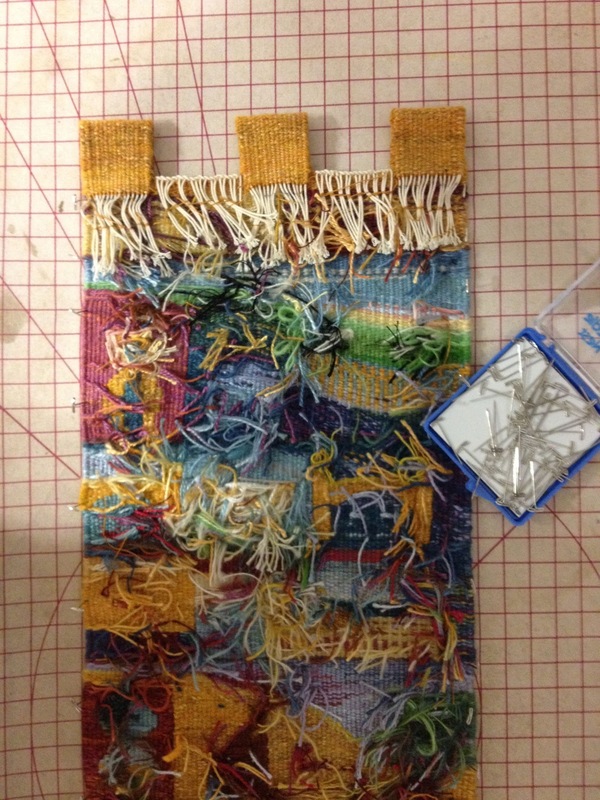 Bring the thread to the back, secure and trim. Here is a detail of the finished slit sewn together. Once all the slits have been sewn I want to give the piece a little steam to relax it a bit. 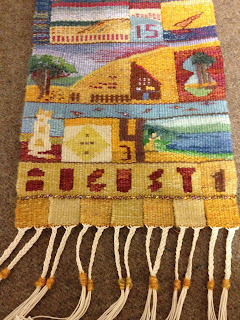 This tapestry does not need a strenuous blocking but a little steam can even things out and make it hang better. 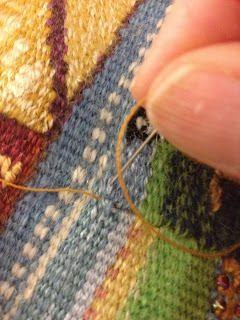 First I pin it out to size doing a little straightening where needed with the wrong side up. 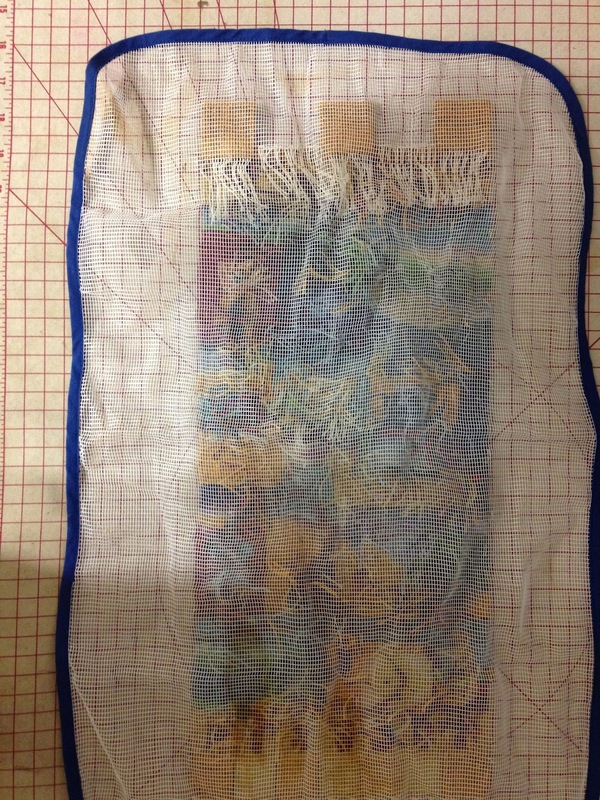 Then I cover it with a press cloth. 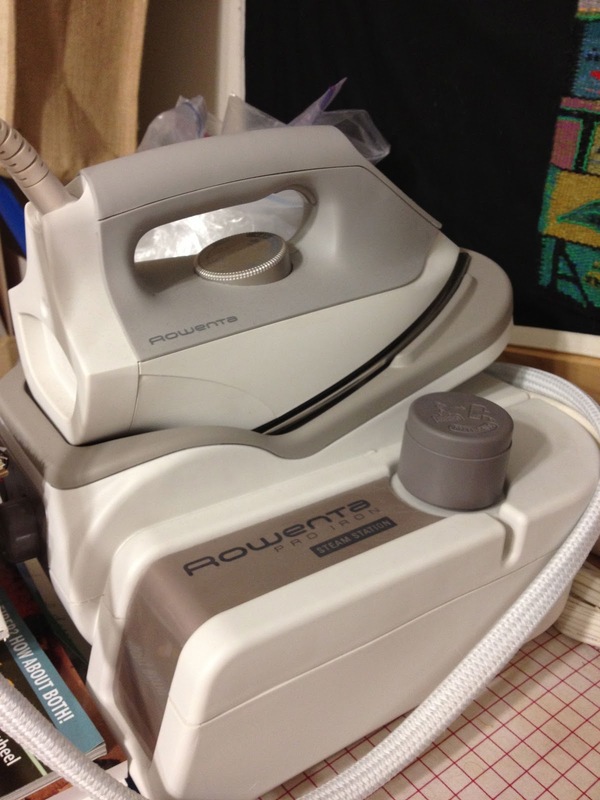 Once my steam iron is ready I hover over it with the steam and let it penetrate until it is a little damp. I find that putting a little steam into the braided warps at the bottom and then pulling them gently while damp allows them to relax and hang better. A picture of my steam iron here. It puts out a significant amount. Once I am finished steaming I will allow it to rest , cool and dry. I may not unpin it till tomorrow as the camel colored ultra suede I have ordered to back it in has not arrived yet. 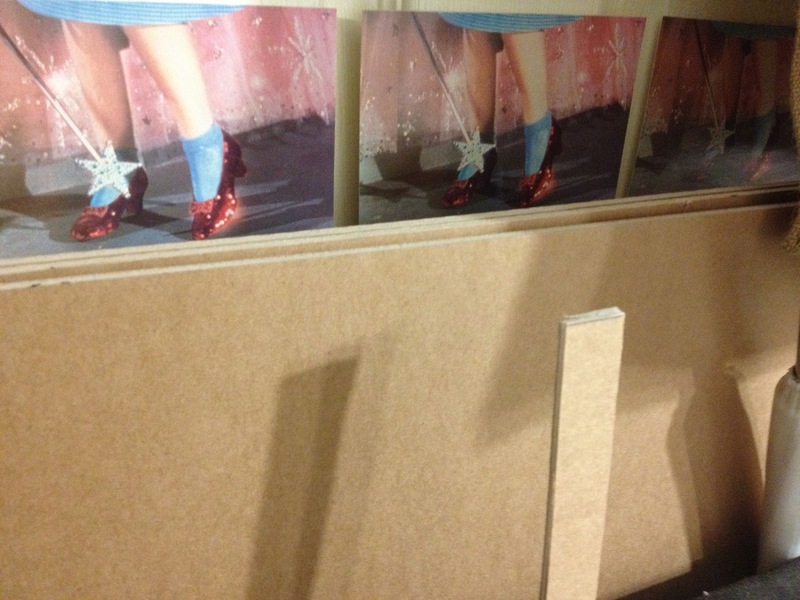 I will include some pictures of that later. Many tapestry weavers do not back their tapestries but I prefer to. It is much easier to keep the dust away with a smooth backing that can easily be wiped clean, and it just looks better to me. 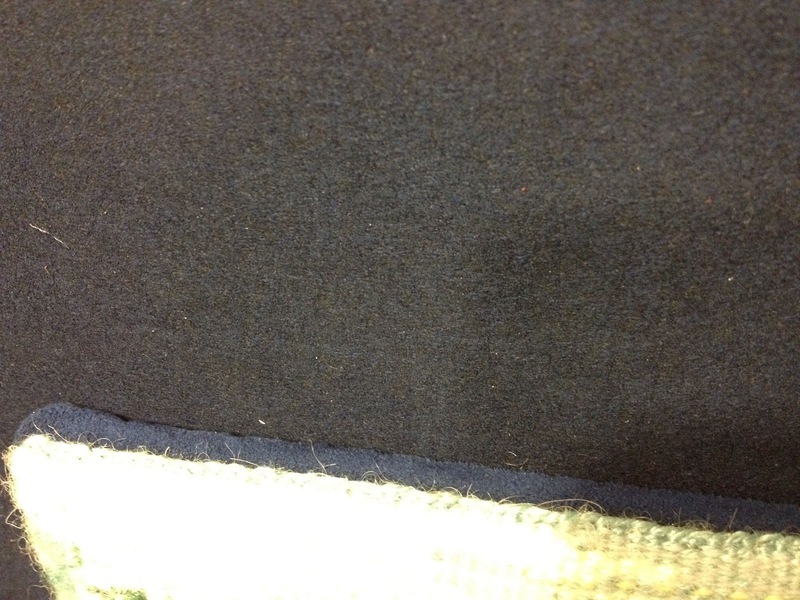 Ultra suede is expensive but a nice smooth cotton would work well too. The advantages of ultra suede are that it can be neatly cut with a clean edge that does not require turning under, reducing bulk and the nice weighty feel will help the tapestry hang nicely. 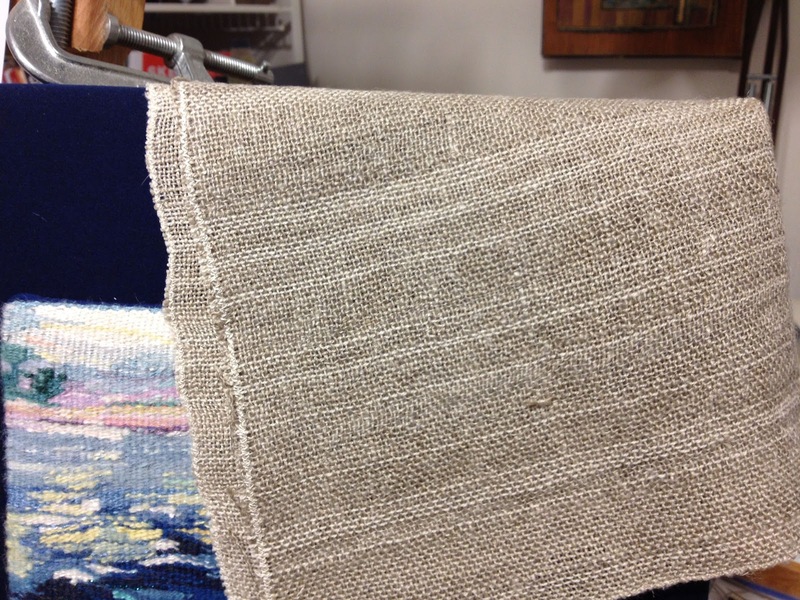 It also has a nice rich finish, and it is a tapestry after all. Here is a piece you may remember if you read the other post on finishing. 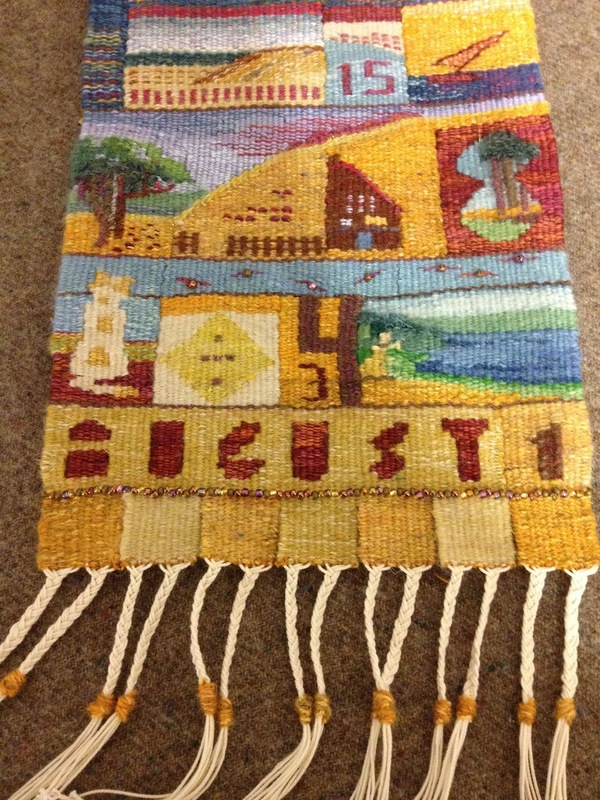 I decided the Riverside tapestry needed more "presence" in the finishing and here is the new improved result. I used the same acid free foam core board that I use to cover with canvas for light weight painting supports when I am painting out doors. 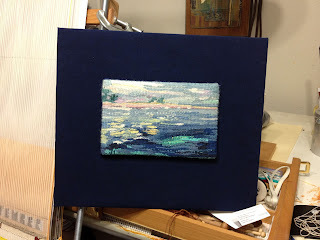 For Riverside I cut one piece of foam core the size of the actual tapestry and covered with the dark blue Ultrasuede and then stitched the tapestry to the board. To pad the surface a bit and make the stitching easier you can place a piece of flannel or fleece between the board and the fabric. 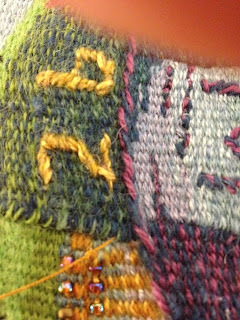 Then I cut a piece which would leave a three border and covered it in the same way and glued the smaller piece on to the larger. I could then add a picture frame but this seems substantial enough that I could add a hanger or wire on the back and call it done. 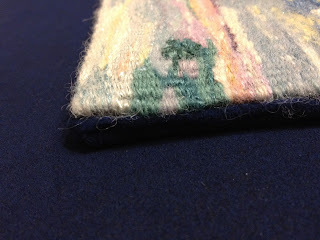 Here is a picture of the corner showing how the tapestry is floated on the larger piece of board. 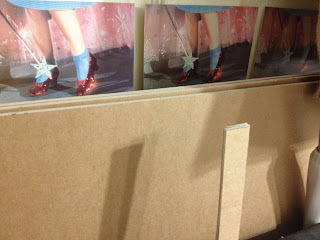 Here is another photo which shows the edge in different lighting. Of course if you like to do other kinds of shaft weaving you could also hand weave the fabric for mounting the tapestry. 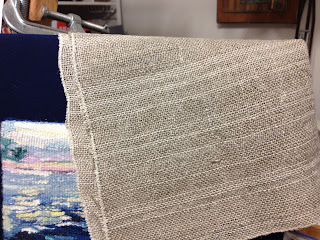 Here is some linen I wove on my floor loom that I used for mounting a tapestry a few months ago. Wow! Great instructions. I can hardly wait until I finish my sampler to try some of them. 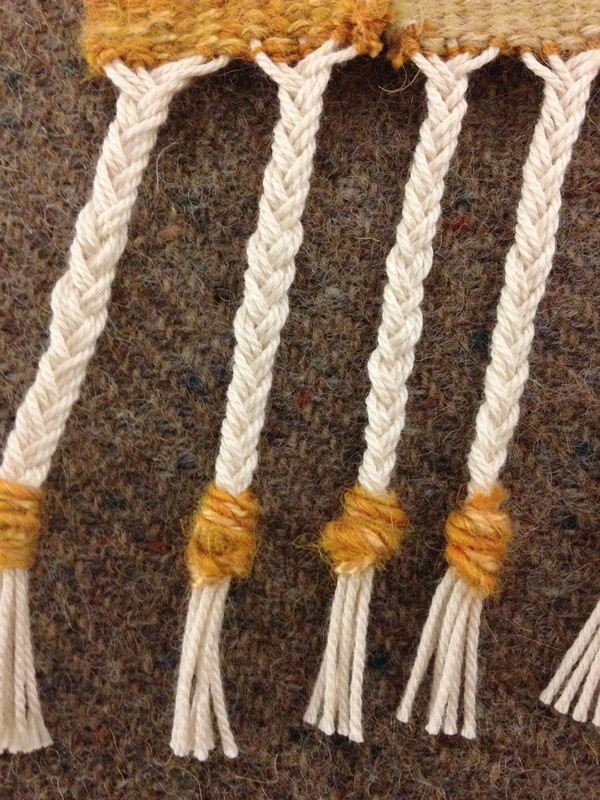 I need to remember to weave some slits first! Beautiful post. 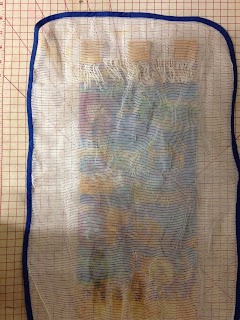 It is good to see how other people finish things... and sew slits! I don't do it this way, but I bet it works fine. Thanks everyone. 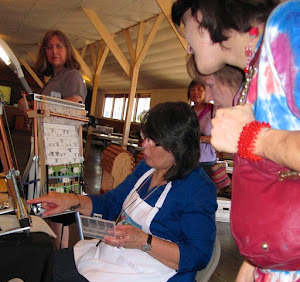 I am experimenting with different ways to do things so I can find what works best for me. It is an ongoing investigation!